Collendina Cricket Club veteran Chris Pitfield’s journey has spanned almost three decades at the Cobras. Pitfield, 45, became on 2 February the first Collendina senior club cricketer to play 300 games. His D-grade team’s four-wicket victory over Ocean Grove was a fitting result, given the Grubbers were Pitfield’s junior club. “Collendina wasn’t there (then), so I played my junior cricket at Ocean Grove,” Pitfield told the Voice. He marked the 300-game milestone in grand style, scoring the winning runs with a boundary to conclude the one-day clash against the Grubbers at St Leonards. Victory tasted sweet for the popular Collendina cricket identity only hours earlier he suffered a hamstring injury fielding. “I hit a four but I did my hamstring (earlier) and came into bat at number six or seven. I was hoping not to bat and then I had to and I was pretty lucky,” laughed Pitfield, who also took 1/24 from eight overs with the ball. Nicknamed ‘Pitty’, he was a foundation member of Collendina Cricket Club’s inaugural team as a strapping young teenager who played for Newcomb’s B grade team on 13 October 1990. He began his days at the Cobras as a bowler, snaring 5/18, his best bowling figures, against Newcomb in 1991. All up he has 277 wickets from 300 matches. 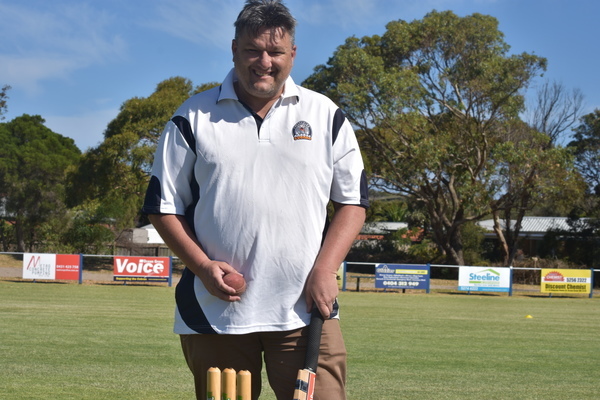 Pitfield, a member of the Cobras’ C-grade team in 1994, has scored 4587 runs for the club, with his sole century coming against Barrabool in 2001. But the journey to 300 has not been without its challenges for Pitfield, who now takes up to a week to recover from the game. “I haven’t got any cartilage left in my toes, basically, so the next day I can’t walk,” he revealed. Pitfield conceded that his cricket retirement was imminent. 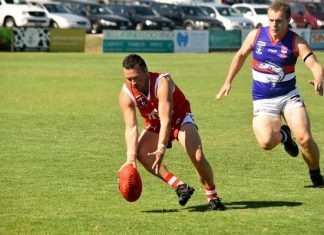 He nominated a second premiership with the D-graders as the ultimate swansong to end his playing days. “Our D-grade is on top of the ladder and I hope to snag one (flag) more before I bow out,” Pitfield said. A father of three, Pitfield is one of 13 life members at Collendina Cricket Club. He has also held a number of roles on the club’s committee, including stints as president and secretary.